Summer's story is a very common one at Pet 24. The huge majority of dogs that go missing are those being looked after by friends or family, while the owners are away on holiday. Even if the dog enjoys being in a familiar home, they will become stressed when they start to miss their owners, so it's imperative that all temporary doggie carers are made aware of this from the start and encouraged to take particular care with gates, doors and when out walking the dog. It's a good idea to put up temporary notices on all exits from the house and garden just to remind everyone of their precious visitor's safety! When walking the dog it's recommended to keep them on a lead or only walk in a secure fenced off area. It's really worth explaining to the temporary carers that although it might not show, your doggie is going to feel more stressed than usual and increasingly wonder where you are. It's imperative therefore that your dog feels safe and secure at all times, particularly when you are away. Here's another happy Pet 24 story-we had to choose this photo of Summer due to her lovely pink tongue and beautiful brown eyes! Thankfully another escapee with a happy ending......as told by Summer herself of course! I stayed at my Mum's friend's house while my family went away on holiday. It was very nice staying there as she gave me lots of treats! But I was really missing my family and this made me want to do something different. On the day I was due to go home, I slipped out when someone left the gate open, walked along the road and tried to have a great time, though I was feeling stressed at being out on my own. I went into the corner shop where the owner was really nice to me and gave me some water. She rang the Pet 24 number on my tag so that I could be collected. She told everyone that I was really good, didn't move from the shop and that everyone who came in made a fuss of me. Frankly, I was relieved to be inside and somewhere safe. Then my Mum came to collect me and my adventure was over. I was very happy to see her! I wouldn't have run away if I'd known it was the last day without my family! This is such an unusual story about one of our Pet 24 members, Buddy, that we thought we just had to publish! His owners kindly adopted him from the Dogs Trust Centre in Kenilworth. Buddy's had many issues to deal with, probably from being mistreated in the past, but now thankfully he is with a loving family who are giving him a caring home-and he's earning his keep.... what a smart dog! position. We were advised to ease back a little and we did so. thought that a holiday trip to France would help us all bond together. In August 2014,after obtaining his passport, we set off for a trip to France via Eurotunnel. to return home earlier than scheduled. This involved a trip to the Pet Passport Centre at Euro-tunnel. on a windy stormy day. to be here than on the open road. adding up the cost of taking Buddy abroad. man hanging to the underside of the camper. unwelcome hitch hiker to clamber from under the camper and walk away. In relief, a swift recalculation told me that Buddy had more than paid his dues. Buddy? He quickly realised his hero status and milked it for all it was worth. loving life. Our little hero! As you can see Frank is a big part of our family. On the day he went missing we were on a normal walk in the woods near our house. We think Frank must have caught the scent of a fox or something strong, as he suddenly ran away and kept running even when we called him back. Our whole family walked around the woods for nearly an hour-we were out of our minds with worry as we’d never lost him before. Then my mobile rang-it was a Pet 24 person to say that Frank had been found and was safe in a house with another dog and 2 children making a fuss of him! It’s hard to write how relieved we were-and we are all so pleased that he has a Pet 24 tag….this is a great service and I will recommend it-thank you! This photo of our beloved Molly says it all! She went ‘awol’ in our local park having chased a squirrel and deciding to ignore me! It was very wet and I really thought she would come back to me pretty quickly, but after calling and calling her-no Molly. I went home in a bit of a state to be honest. Then my partner had a call on his mobile from Pet 24-someone had found her and she was sitting in their car waiting to be taxied home! 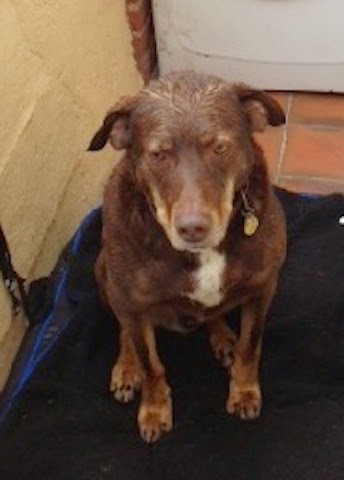 I cried with relief when the lovely man brought her to our house- in the pouring rain. She had a nasty shock and was subdued for a few days, so this photo is quite an honest one! So many thanks to the Pet 24 team-thank goodness you’re there! A 'before and after' story-in pictures! No need for words are there?! He didn't collect that head-mud just trotting down the road! Apparently he's learnt his lesson and has now left his 'Houdini' days behind him. His loving owner isn't taking any risks though, and insists he wears his Dogs Trust tag at all times! Winston is a Tibetan Spaniel rescue dog from Wood Green Animal Shelter in Godmanchester and it was they who recommended Pet 24 to us. It is just as well they did. Within his first week we realised it was no good walking him on a conventional collar and lead. He would wait for you to get slightly ahead, tug backwards and slip straight out of his collar, so we now walk him on a harness. His favourite game, however, is to slip out of the house between your legs unnoticed whilst you are packing the car. Despite our best efforts, he has variously made his way to the local pub, the cul-de-sac round the corner or other streets in the village. He once tried to join a running club going across the field footpaths to the next village! On this occasion, we received a call from Pet 24 and we were on our way to round him up, although it did cost us a bit in wine and chocolates for the kind people who took him in and fed him toast and biscuits. We are very glad that we have Winston back, safe and sound, albeit a little smug - thank you Pet 24! I just wanted to drop you a line to say thank you so much for helping us get Tilly back. 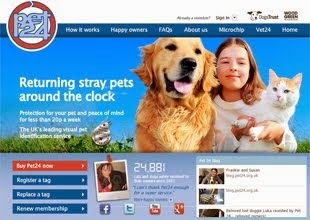 Your Pet 24 service worked perfectly and we now have our beloved Tilly back home with us. She had only wandered half a mile from home but across a busy main road and was too scared to cross back. She is very thin but otherwise fine. Cleo was only missing a short while, whilst out with her friends something spooked her and she got herself lost in the woods in thick undergrowth. Despite calling her and the usual whistling she continued to go deeper into the woods. This is only the second week of her being ‘off lead’ and until now she's only had one other occasion when she 'spooked' but found her way back safely that time. This time she followed her instincts and made for the end of the walk side of the woods where there is a gate. She was stopped from going through by a couple walking their rescue greyhound. They attached their lead to Cleo and seeing the Pet 24 tag called the number and gave Cleo’s ID number. Fortunately, my friends and I caught up with the couple at the gate. I was very grateful to the couple who had the sense to hold onto her and also to call the Pet 24 number straight away. All is well now and Cleo, despite her stress at getting lost, is happily curled up on her favourite settee. Had I not been able to find Cleo at the time it is a comfort to know that as soon as I had access to my email I would have known that someone had reported her found. Great job Pet 24! I recently returned home to NZ to visit my mother in Auckland, leaving my dog 'George' with my auntie and uncle in a small village in the Yorkshire Moors. George is lovely old Border Terrier that we got from the Dogs Trust in Darlington last year who is a real character. Despite having a gunshot wound in 2 legs he loves his daily walks and these are the highlight of his day. On Day 1 of him staying with my relatives, I received a phone call from Pet24 to say that George was sitting by himself in a pub and the publican was looking after him! I was obviously very shocked and worried, but with Pet 24's help I was able to ring the publican and ask him to keep George in there until I could get in touch with my auntie to pick him up - which she promptly did. It turns out he had got so excited waiting for his walk he decided to go by himself and called in the 'local' for a tipple along the way, a bowl of water and a pat from the locals!! As the weather turns colder it’s so important to remember that even though our beloved dogs have some sort of fur coat, this doesn’t mean that they will be warm enough either inside during the day, when the heating might be off, or outside, when they can’t add another layer of warmth as we do! 1. Check how the breed of your dog is effected by cold weather. If you don’t already know, this can be discovered easily online or by asking your vet. Not all dogs will need the same attention/protection when it comes to ensuring that their bodily warmth is maintained. Obviously, short-haired dogs like greyhounds, boxers etc are bound to feel the cold more than Alaskan Huskies...but there are some surprising exceptions to the 'thick-fur-coat' expectations we might have! 2. Make your dogs walks shorter when it’s cold-they’ll appreciate it even if they can’t tell you! For older dogs do remember that those prone to arthritis or other muscular problems, really only need gentle exercise twice a day. Most owners are very alert as to how their dogs are walking- do notice any small changes and take note of any reluctance on their part to go out or stay out….which doesn’t mean to say ‘give in to their immediate demands’ !! Pet 24 boss, Buster is pretty good at ‘faking it’ at the start of his walks, (he often refuses to budge once outside of the front door!). He’s a little stiff in the mornings, so we often carry him until he's in sight of busy squirrels- so that his ‘squirrel-fever’ soon makes him forget his all aches and pains! He’s allowed shorter walks when it’s cold, even if it means bringing him home earlier and going out again with his younger and still bouncy sister Roxy (head of dog/customer services). 3. If your dog HAS to be outside then do insulate their kennel against the cold, taking special care to cover the entrance with an effective, flexible material. There are many inexpensive options listed online that really work, are quick to set up, and will ensure a warm and cosy bed for your loved doggie! When dogs become cold over a few hours even, their resistance drops and they are much more prone to illness…as owners are to vets bills! 4. PLEASE don’t trim or shave off their winter coats…no matter how scruffy your dog looks! It’s part of their natural defence against winter weather. When we see a freshly clipped dog in the park in the winter (and sadly we do!) it’s all we can do do to resist getting hold of the owner and ripping off THEIR winter clothes just to say ‘ How does THAT feel buddy? !’ Sadly, some people are more interested in how their dogs LOOK rather than thinking about how their dogs FEEL. 5. Please don’t start to overfeed your dog just because it’s colder weather-that’s a real projection of (what many believe to be) human needs, onto dogs! You’ll just end up with an overweight and unhealthy pooch. 6. Paying a little extra attention to your dog’s needs in the winter can help with vet’s bills…dogs are prone to extra medical stresses in the winter just as we are. Be aware of extra chemicals/salts on the roads and pavements that dogs can pick up easily- do check their paws after a walk through any unfamiliar road and pavement treatments. Buster and Roxy were pretty disgusted when we bought these ‘Dayglo’ jackets, but they are warm and now they can easily be seen at dusk/night when they wander off in the park. These have a warm fluffy lining and now that it’s colder Buster actually ASKS for his coat to be put on by nuzzling up to it when we get out their leads-bless him. Roxy runs about so much more that she warms up quickly and wriggles around on her back to ask for hers to be taken off, which always results in a mad lamb-like gambol! Here's hoping that you and your beloved doggies all stay warm during the coming weeks! NB! The attached lead is NOT a safe walking lead-it's there to stop Buster wandering off due to the utter boredom he experiences when having his picture taken (unlike his sis who'll soon be modelling her latest pearls-she's such a poser as soon as any camera appears). 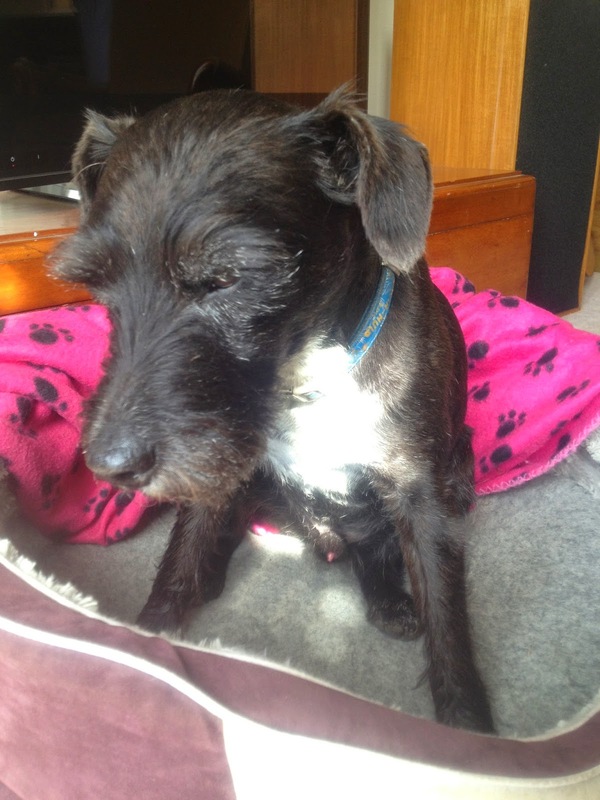 Frankie is home safely thanks to his Pet24 membership and fab owner Susan!